The Slocum electric gliders can be deployed for up to thirty days and travel up to 1500-km (longer using Lithium batteries) collecting scientific data from depths of 5 to 1000m. 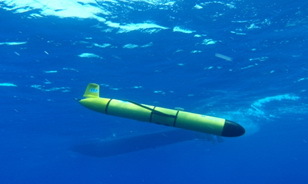 The gliders are manufactured by Teledyne Webb Research and are classified as Autonomous Underwater Vehicle Gliders (AUVGs). The ~6ft long pressure hull is made of carbon fiber and aluminum and has a payload bay for a standard or custom suite of instrumentation. Data transfer and communication is accomplished via Iridium or radio frequency (RF) modem . These gliders use a change in buoyancy to change vehicle pitch and create forward motion. An external oil bladder is filled or drained to change buoyancy and the wings convert the vertical velocity into forward movement. Multiple ascents and descents create a vertical sawtooth trajectory. The glider navigates to waypoints by using surface GPS fixes to apply corrections to dead reckoning. A team of two can easily deploy and control several gliders from a small boat and access to the internet. Slocum glider image courtesy of Teledyne Webb Research. 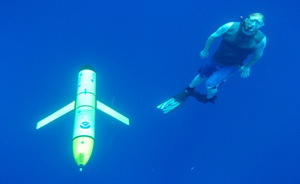 Slocum glider and diver image courtesy of Teledyne Webb Research.